Concordia's Carissa Garcia shoots the ball as Bishop Dwenger's Molly Ream tries to block the shot during the second quarter at the girls basketball sectional at Concordia on Friday. Bishop Dwenger's Lexi Linder pushes past Concordia's Meg Barkley to get to the hoop during the first quarter at the girls basketball sectional at Concordia on Friday. Not having school for three days can make anyone a little rusty. 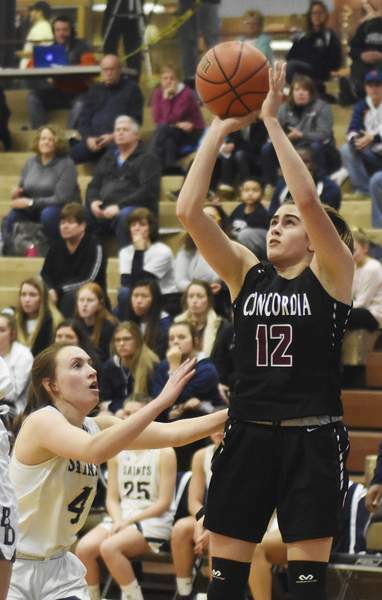 Both Concordia and Bishop Dwenger were as cold as the single-digit temperatures outside to start Friday's first-round Class 3A Concordia Sectional game. Neither team scored a basket until Concordia's Ellesyn Fritcha hit a corner 3-pointer with 1:50 left in the first quarter. The Cadets then heated up and easily won 56-29 to move on. Garcia was hot for the Cadets (16-6, 6-4 SAC). The Northern Kentucky recruit had 24 points and was eager to show her teammates what postseason basketball was all about. 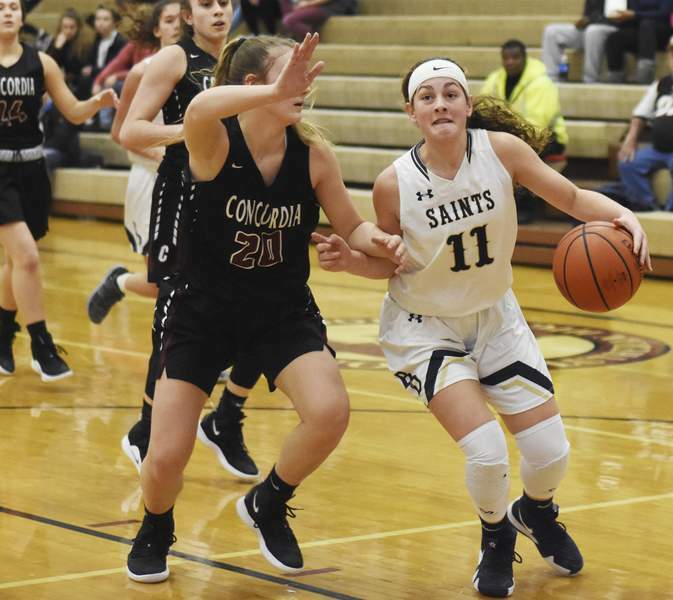 Garcia stamped her name in the record book when she became the program's all-time leading scorer this season in a win over Dwenger, and again reminded the Saints (11-10, 5-5) why she's so good. She conducted the offense all night, including navigating a tough Saints press. 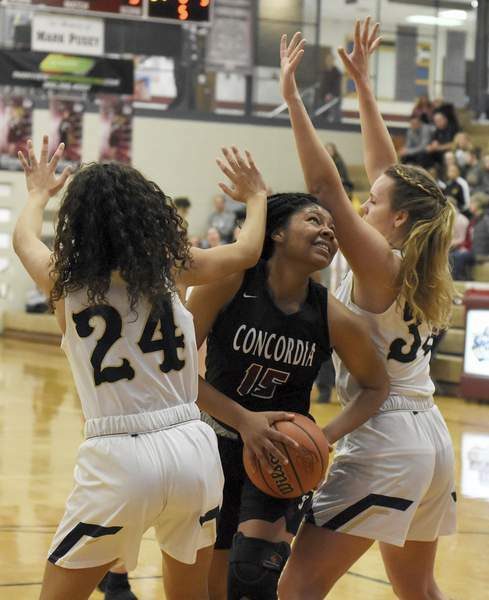 With the ball hardly touching the floor, the Cadets moved the ball from Garcia to Nautica Rogers, who found a cutting Cierra Calloway to finish the layup and put Concordia up 33-19 with four minutes to play in the third quarter. “We just played together as a team and came out cheering each other on, making the extra pass and just executing our game plan,” Garcia said. That Saints' press did give the Cadets some trouble at times, and Concordia coach Dave Miller wants to see how his young team will handle it if they face pressure again. “That's some of our youth and it's sectionals, so it's a mindset of 'oh I gotta do really well,' but we'll grow,” Miller said. Garcia's only senior teammate, Rogers, was too elusive for the Saints. She dominated the boards, specifically on the offensive glass, recording a double-double of 13 points and 13 rebounds. “This is really her first year of varsity experience out of her four years, so I'm just really proud of her; she's come a long way,” Miller said. Rogers tore her ACL the end of her sophomore season and missed all of last year. “She's really growing and the future's really bright for her if she wants to keep playing,” Miller said. The Saints' season ended, but the team has much to look forward to as they graduate only Bridgette Black. Molly Ream led with seven points. The Cadets, who've won their sectional four straight seasons, have a tendency to get hot at the right time. After dropping three straight, they've rattled off three wins heading into a battle with Woodlan at 6 p.m. today.